Noida: Happiness, gaiety, excitement, contentment and varied emotions marked the beginning of three day “ Convocation 2017” of Amity University ,Uttar Pradesh which was attended by over 3298 Graduands of several Programs enrolled under Arts Domain on the first day at University Campus, Sector-125, Noida. Graduands from over 38 Institutions came from different parts of the country, accompanied by their family members and friends received their much awaited Degrees and Diplomas. Graduands clad in black robes, red and yellow capes representing their respective programmes, beamed with joy and exultation as they re- united with their faculty members, and mentors who were equally excited to see their students doing exceptionally well in their careers within a short span of time. The ceremony commenced with a band from CRPF leading the procession of Trustees and members of the Management, Senior officials of RBEF and Directors/HoDs of various Institutes and Departments of Amity University. 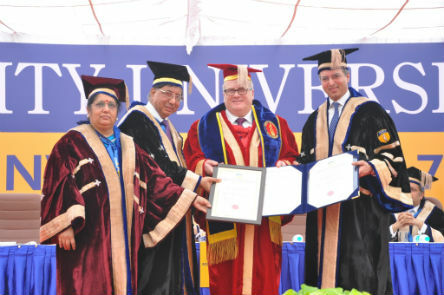 Dr. Atul Chauhan- Chancellor, Amity University, Uttar Pradesh declared the Convocation open. Accepting the Honorary Doctorate Degree in Philosophy (D Phil) with honor and humbleness, Sir Dr. Huzaifa Khorakiwala, CEO, Wockhardt Foundation applauded Amity for inculcating human values in the students and shared that Wockhardt Foundation runs online “World Peace Keeper Movement” as part of which over 2 million peace keepers promote the values of Gratitude, Forgiveness, Love, Humility, Giving, Patience and Truth and each value stands for a day of the week. Wishing and praying for the success of the graduands, Sir Dr. Huzaifa advised them that peace of mind is very important which can be achieved through practice of simple human values. He remarked that for a human being, outer success in the professional world is as important as inner success of the soul. Delivering the acceptance speech after receiving Doctor of Philosophy (D. Phil) Honoris Causa, Mr. Andrew Harding, Chief Executive, Management Accounting, Association of International Certified Professional Accountants (AICPA) stated that it’s an honor to receive Honorary Degree from an Institution of repute which has national and International presence. On the occasion Chartered Institute of Management Accountants (CIMA) signed an MoU with Amity, as part of which a “Center of Excellence” will be established in Amity Business School, Amity University to promote Management Accounting for businesses across the world..He remarked that in the era of exceptionalism where everything is changing exceptionally fast, it is important for a human being to learn new skills on daily basis. In such a scenario, the role of universities become very important in supporting people to make their careers. He expressed with conviction that very soon Accounting is going to be a force which will bring certainty and light in increasingly complex world. 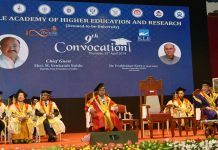 While accepting the Honorary Doctorate Degree in Philosophy (D. Phil), Shri Piyush Pandey, Executive Chairman and National Creative Director, Ogilvy & Mather India shared learnings of his life with the graduands, which he stressed, apply to everyone. He shared that he had no idea that he would get into the field of Advertising but he was always surrounded by creative people and he kept breathing creativity and learning from the people around without knowing. He remarked that he has taken every idea from the people of India; observing the people around him; taking ideas from them and converting them into meaningful messages. He called upon the graduands to practice the art of respecting the environment including the people. He encouraged them to do with passion whatever they intend to do since with passion comes enjoyment and the more one enjoys, the more passionate he/she becomes towards the profession/work. Launching Amity Alumni Portal where Amity Alumni from anywhere in the world can register and stay connected with the family, Dr. Ashok K Chauhan- Founder President, Amity Group said that the parents of Amitians made a discreet choice by admitting their children in Amity which does not just offer a degree but also transforms the personality of the students and make them complete human beings. He expressed whatever comes into the life of Amity students and wherever they go, they are groomed to succeed at every level. He encouraged students to commit themselves to their goals in life and keep moving ahead with a conviction in their hearts that they have been given the best education in the world enriched with rich India values and sanskars. Presenting the annual report of the achievements of Amity University and its faculty members and students, Dr. (Mrs.) B Shukla- Vice Chancellor, Amity University, Uttar Pradesh highlighted the massive growth of Amity Education Group with five Universities across India, 25 National campuses, 10 International Campuses, 9 World Class Universities, 25 Schools and Pre-Schools, 1,50,000 students enrolled in 400 programmes in 83 disciplines. She briefed the gathering with research papers written and presented by the faculty members, 800 books published and 7,000 papers authored by faculty members, ongoing 175 Research Projects, over 870 patents filed by the Scientists and Researchers, National and International Accreditations received by the University and other accomplishments. 79 Gold Medals, 77 Silver Medals, 36 Bronze Medals and 12 PhDs were awarded to the meritorious students. 56 students were awarded Baljit Shastri Award and 10 students were awarded Best Student Trophies. Pratyush Prakash from LLM (Criminal Law),Amity Institute of Advanced Legal Studies was felicitated with Dr. Goolam E Vahanvati Memorial Award for Excellence in Master of Law; Ishita Nagpaul from LL B, Amity Law School, Noida with Dr. Goolam E Vahanvati Memorial Award for Excellence in Bachelor of Law; Sarthak Gaur from Bachelor of Arts,LL.B (Hons), and Ankit Mohindra from BBA LL.B. (Hons), Amity Law School, Noida with Shri Raian Karanjawala Trophies.